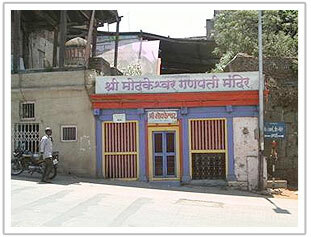 The Modakeshwar Ganesh Temple is a famous temple of Nasik. The temple derives its name from the 'Modak' a special Maharastrian dish made of coconut and jaggery. This dish is considered to be Lord Ganesh's favorite. The idol has an original shape of a modak and hence is called Modakeshwar. According to a legend, modaks used to be found in this temple. The idol in the temple is believed to be self emerged and is also known as 'Swaymbhu'. Modakeshwar Temple houses the idol of Ganapati. This ancient temple of Ganapati facing east is situated at Asarachi Ves on the road from Ramkund to the cemetery. Ganesh festival is celebrated here on all ten days in Bhadrapada. Ganesh festival is a gala festival here on all ten days in Bhadrapada. The Modakeshwar temple has rendered holiness to this area which otherwise looks quite ghastly in lieu of the cemetery and a long stretch of ground along the riverbank.